Chinese New Year Is Almost Here!!! Hey, it’s Brian from KizugawaCity here. This time I want to tell you about an important festival to many people in the world – Chinese New Year. Chinese New Year is the start of the year in the lunar calendar. The date changes every year, but it usually is around the end of January to the middle of February. There are many traditions for celebrating Chinese New Year. 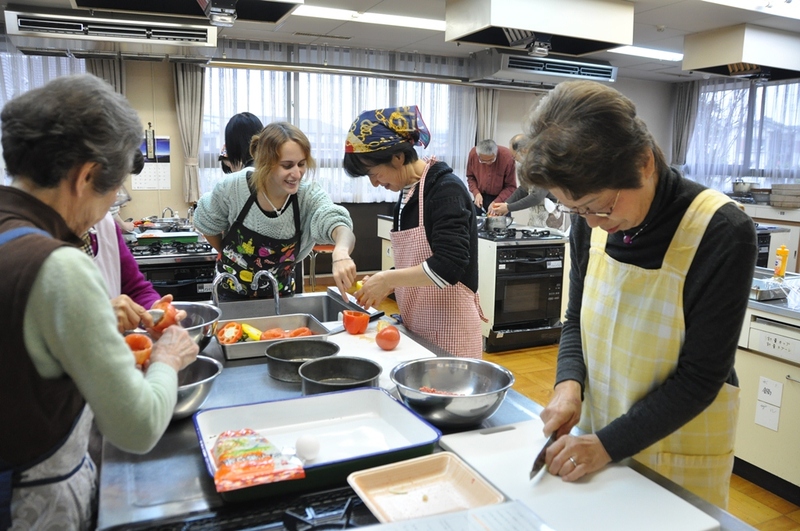 Families prepare delicacies and gather together for a big meal on the eve of Chinese New Year. The meal typically includes a hot pot, a fish dish, dumplings, Chinese rice cake (similar to mochi), and daikon. 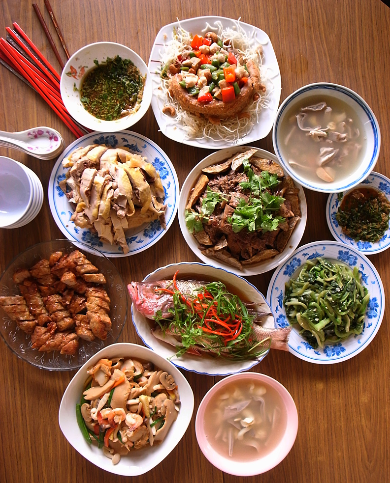 There are many local variations of the content of the meal. In Taiwan, people eat chicken, leek, lima beans and spinach, including the root, for prosperity and longevity. 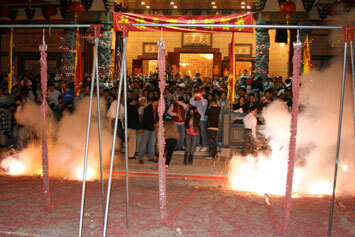 With the common name “Chinese New Year,” some may think that it is only celebrated in China. 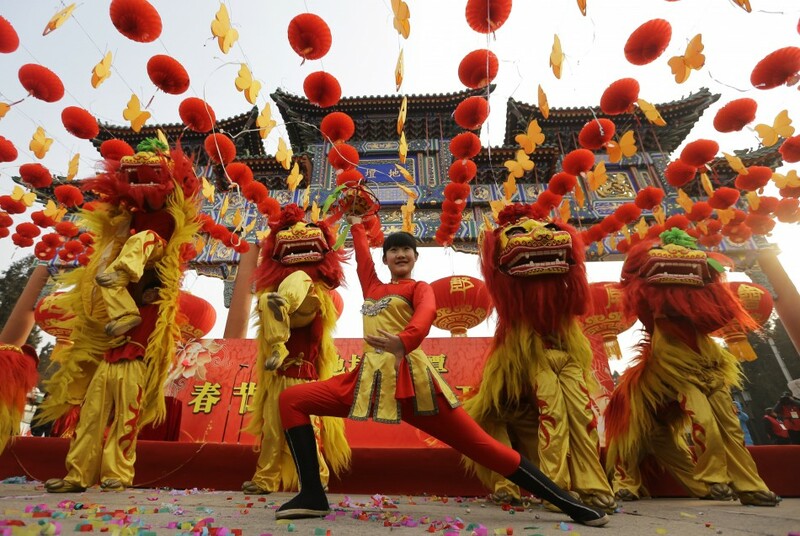 Chinese New Year is also celebrated in Taiwan, Singapore, Malaysia, Thailand, UK, US, and other countries with a significant Chinese community. In the US, there are big celebrations in many cities such as New York, San Francisco, and Los Angeles. A big parade is held with many performances. 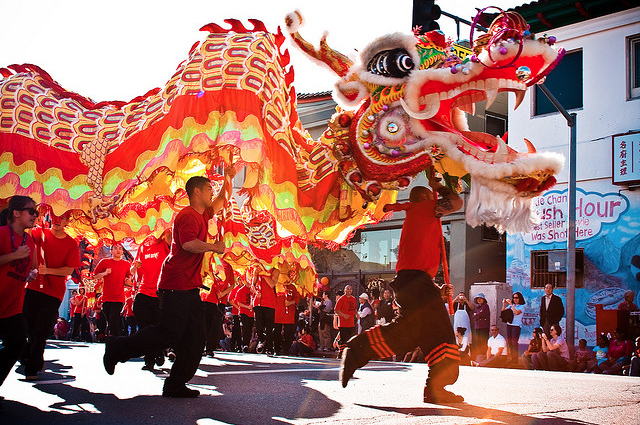 Chinese New Year celebration has grown into a pan-Asian fusion celebration. Korean, Japanese, Vietnamese, and even Hispanic floats appear in the parade. The most iconic performance is the dragon dance. Firecrackers are lit to start the year with a bang. This year, it falls on January 31st. 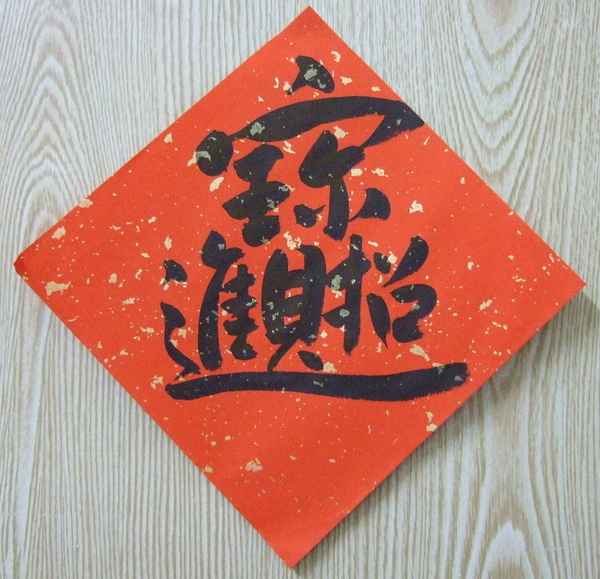 To prepare for Chinese New Year, people clean and decorate the house with oranges and calligraphy on walls and doors. 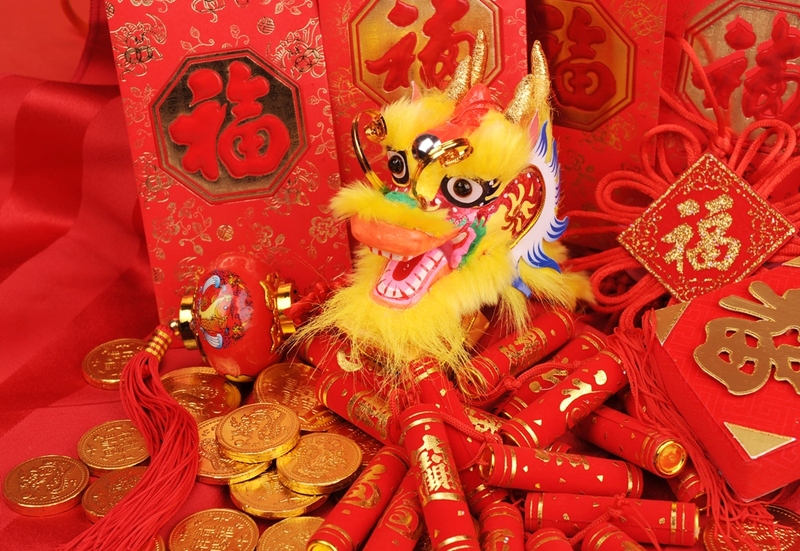 You can research online for ways to celebrate Chinese New Year. If you are looking a reason for another cleaning day, Chinese New Year is right around the corner! 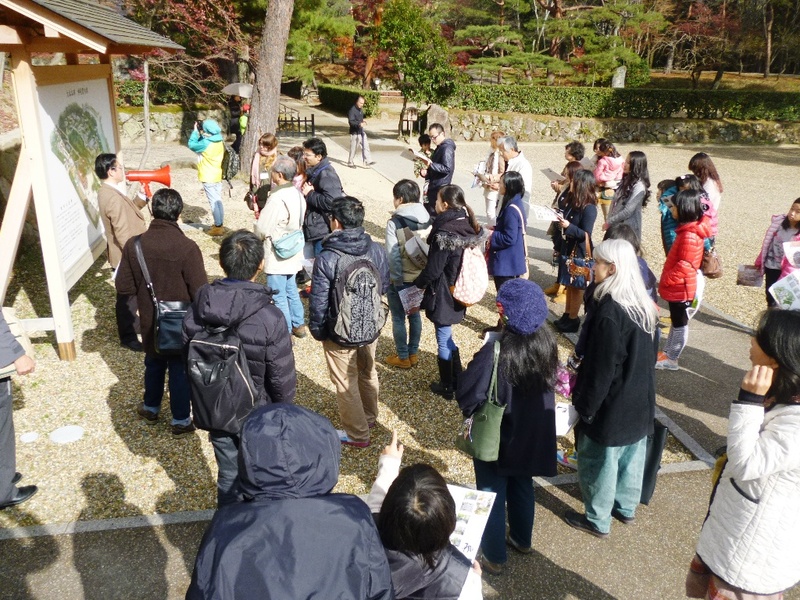 One Day Trip in Kameoka is a day trip program held every year organized by the Kameoka International Exchange Association and Kyoto Prefecture International Center. 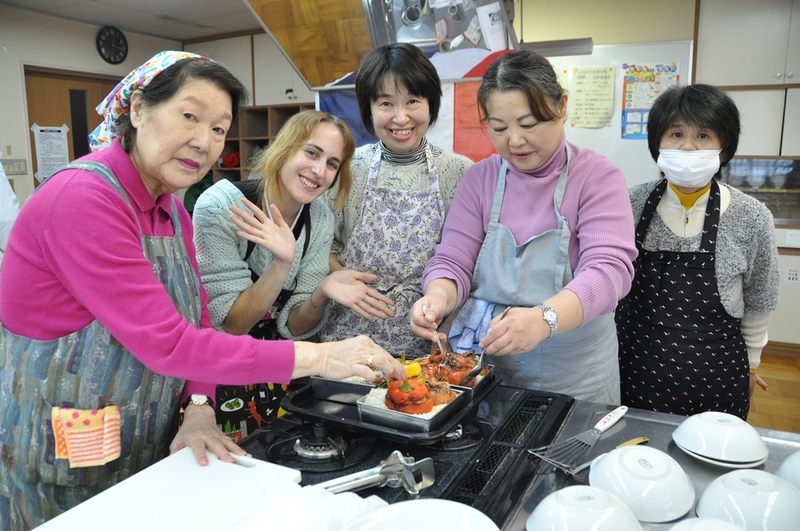 International and Japanese participants spend the morning exploring Kameoka, and in the afternoon the international participants visit their host families to enjoy various activities together. You can think of it as a homestay without staying the night. It was a big group! This year, we had a total of 18 international participants from 13 different countries: Korea, Mongolia, China, Taiwan, Vietnam, Swedem, India, Australia, Egypt, Thailand, Russia, America, England and 16 host families. 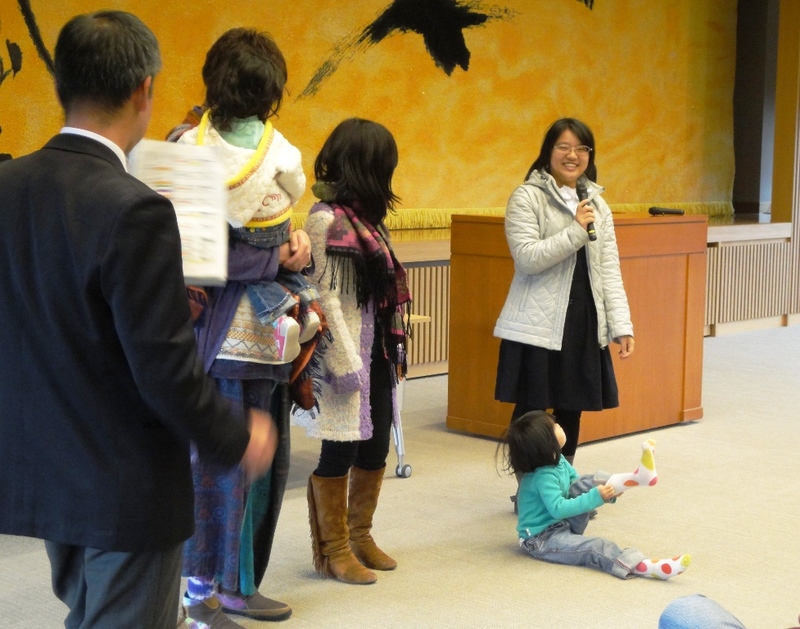 We also received cooperation from The Kyoto Crocul Group, Kameoka Municipal Museum of Culture and Oomoto. After a very detailed explanation about Kameoka’s history at the Kameoka Municipal Museum of Culture, we went out to explore the old castle town before it started raining. Due to the rain we headed to Oomoto, which is located at the Kameyama Castle ruins. After an explanation of Oomoto, we went out to see the castle ruins. 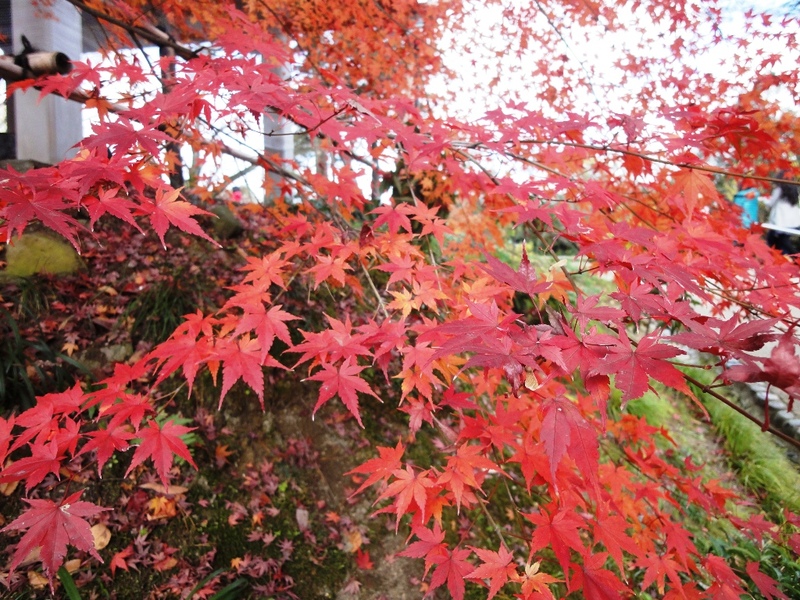 The autumn leaves could still be seen and was very beautiful. This time we had more than the expected number of participants, both international students and residents and host families. They had a great time talking and learning about each other and I’m sure they all enjoyed the event. Hello everyone, Mark from the International Affairs Division here! It’s been a while since my last post, but this is about a field trip we organised and held on Sunday 15th December. 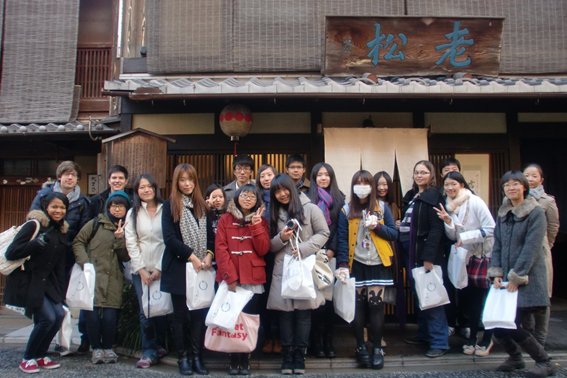 Altogether we were 21, with exchange students studying at Ritsumeikan and Doshisha universities, from China, Taiwan, Hong Kong, South Korea, USA, Germany, and Australia! We all managed to meet up on a chilly morning and left on our bus just past 9am. 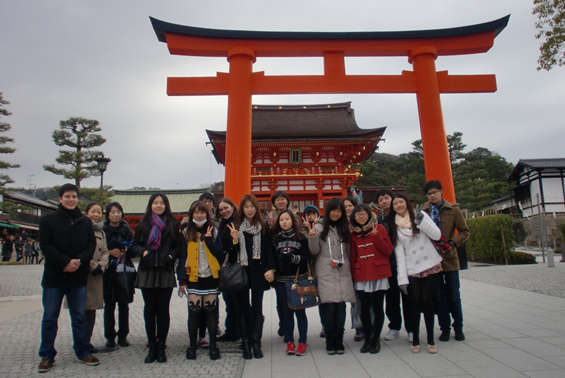 Our first call was Kyoto’s famous Fushimi Inari-taisha Shrine. Arriving just past 9:30am, it was already busy with many people trying to get the best shots of all the torii gates. Everyone enjoyed trying to do the same, and our guide taught us lots about the meaning and the history of the shrine. Personally, Fushimi Inari is one of my favourite shrines in Kyoto, so it was nice to go and help show the exchange students around! Afterwards, we took a trip to the Gekkeikan Okura Sake Museum. Here we were given a very detailed, but easy-to-understand, explanation on the sake-brewing process and history of sake by a very knowledgeable guide. The tour through the museum includes replicas of the actual traditional tools and containers that the brewers used in the olden times to create the famous sake made in and around Kyoto. Once we had finished the tour and the explanation, we were all (the members over 20, of course!) given a chance to try some of the local sake and umeshu brewed there. As there was a shop there, I myself was very tempted to purchase some! I think the students came away with a good understanding of both what sake is, and the taste of it! Once we had our fill for lunch, we went on to a place called Oimatsu, which crafts and sells traditional Japanese confectionery, and in particular, Kyoto confectionery, or kyogashi. 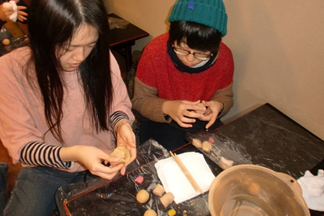 Here we were given a wonderful demonstration and taught how to make our own kyogashi creations! We were all given the basic ingredients, and shown how to make one, then had the freedom to make a couple more of our own designs. 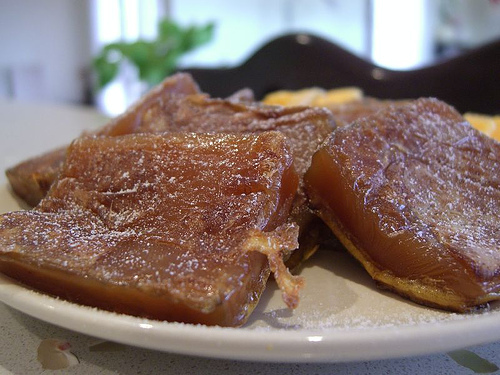 It is said that enjoying this kind of confectionery is an experience for all 5 senses: naturally, the taste is to be savoured; the design of the sweet appeals to the eyes; the touch and the smell as you eat it as well. However, how are the ears and hearing involved? Apparently, hearing is the most important sense of them all! By giving a name to our creations, when we hear it, we can imagine the scene and what the sweet represents as we enjoy eating it. Once we were finished, we had one with some maccha tea, and brought our other ones home with us for later! Finally, we finished the day at the Nishijin Textile Center, where we were again given another great explanation and shown examples of the exquisite detail that go into Kyoto’s Nishijin silk products. Ending the day with the kimono fashion show at the Center, I think all the students got a great selection of photos of some of the best kimonos that Kyoto has to offer! After the show, we all made our goodbyes and went our separate ways. 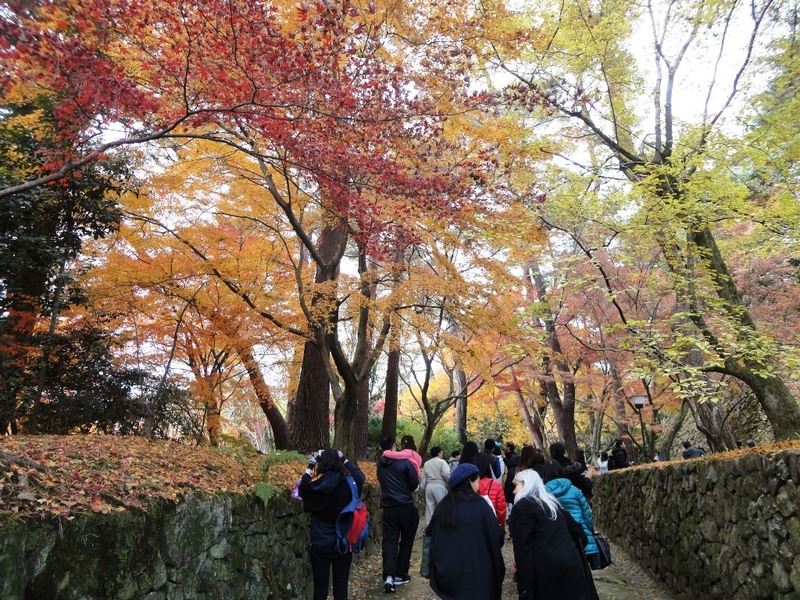 Everyone really seemed to enjoy themselves despite the chilly weather, and I think we gave everyone a really good opportunity to learn a bit more about things that exchange students don’t usually get a chance to. All in all, a great success, and I had fun too! Happy New Year! This is Steven from Seika. 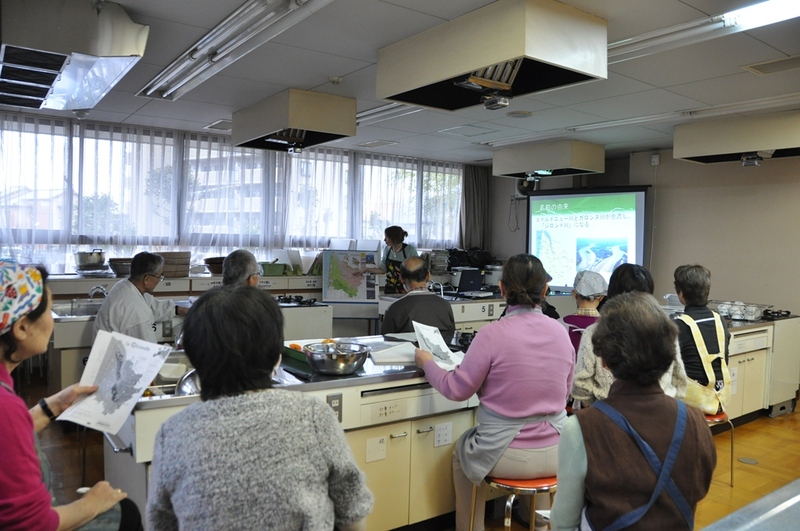 This article will be about the 5th lecture in my series, which was on Thursday, December 5th at the Seika Town Office. The topic for December was the 50 states of the U.S.
Japan has almost as many prefectures (47) as the U.S. does states, and each prefecture boasts some kind of famous attraction or product. For instance, Aomori Prefecture is known for its apples, and Oita Prefecture is famous for hot springs. I wanted to show people that all of the states in America also have their own claims to fame, and to talk about how different all of the states are. I presented the 50 states in alphabetical order. For each state, I showed a map highlighting its location within the country and talked about the state’s total area, population and racial statistics as of last census, nickname, largest city, and capital. Then I gave a brief overview of the state where I talked about what the state is known for. From the participants’ reactions, I got the impression that they knew many of America’s landmarks, but often didn’t know which state they were in. 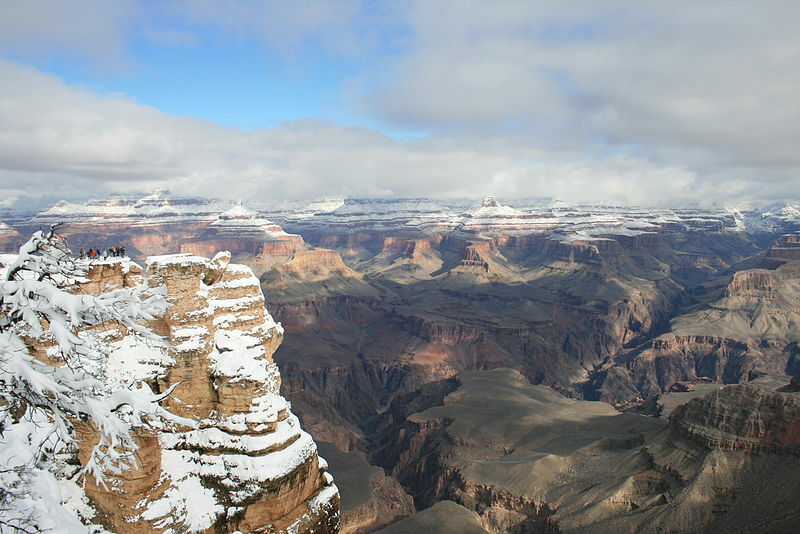 For instance, the Grand Canyon seems quite well-known in Japan; the state of Arizona, in which it is located, does not. After I had talked about each of the 50 states, there was a short discussion. Participants’ questions focused more on American federalism (i.e. the relationship between the federal government and the states) rather than individual states. That concludes the lectures for 2013. Hope to see you all again this year!